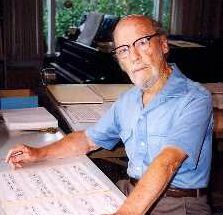 Born 2 January 1913 in Evanston, Illinois, Gardner Read was the composer of more than 150 works; a scholar and author who produced numerous articles and nine books, some of which are considered classics in their field; professor emeritus of composition who taught at a half dozen major universities and influenced the lives of countless young composers; a conductor who has led many of the major symphony orchestras in performances of his own works; and an international lecturer on contemporary American music. In 1978, musicologist Nicolas Slonimsky wrote: "In American music, the name of Gardner Read is synonymous with the best traditions of modern classicism and inspired romanticism." Gardner Read died on 10 November 2005 in Manchester-by-the-Sea, Massachusetts.